​Yearly membership runs from October 1 to September 30 at a cost of $60. 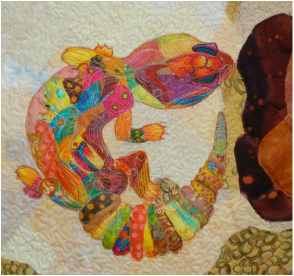 Membership benefits include use of the guild library, participation in guild activities, retreats and workshops, displaying work at our quilt shows, access to the Members Only area of the website and the camaraderie of more than 100 talented and enthusiastic quilters and fabric artists. The Membership table is set up at every meeting, and there will always be a friendly face there to greet you. Visitors are invited to sign the guest book and make a name tag. Various guild pins are available for sale at the Membership table. Starting September 2018, new members will be invited to join the Newcomers Club. Meetings are held every Tuesday morning from 9 a.m. to noon from September through May. Many different activities take place at our meetings: tutorials, demos, speakers, trunk shows, business meetings, etc. The library is open, and a Show and Tell session is held at every meeting. The program starts with Show and Tell at 9:30 followed by announcements. Check out the Activities and Program pages for more information. All meetings are held at the Okanagan Mission Community Hall, 4409 Lakeshore Road (corner of Lakeshore and DeHart) in Kelowna. (See Contact page for map.) Tea and coffee are provided, but members are asked to bring their own cups or mugs. Click here to download our Membership Application. All new members are asked to download, fill out and submit this form at their first meeting. Membership renewals can be done at any meeting. Prospective members may attend one free meeting before making a decision to join our guild. Repeat out-of-town visitors are asked to pay a drop-in fee of $2. •	Please keep coffee away from Show and Tell items. •	Please do not wear strongly scented products. •	Please turn off cell phones during business meetings, programs and workshops.